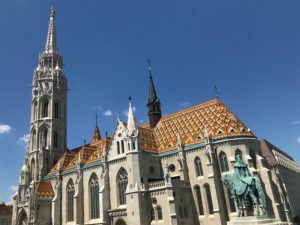 Hello, everyone and welcome to my recount of our first full day in Budapest, Hungary. After last night’s river cruise, I could not wait to get the day started. Breakfast at the hotel was complete with a waffle station and loads of croissants. The day officially began with a bus tour of Budapest. Our first stop on the tour was the Parliament building. The Hungarian Parliament is the country’s largest building, Budapest’s tallest building, and the third largest parliament building in the world. The Parliament Building is most spectacularly seen at night while on the Danube River. We saw the building last night on our cruise when it was completely lit up on the front side and it was truly magical. The next stop on the tour was Heroes’ Square. While standing in the heart of Heroes’ Square, Look up. And then keep looking up. Who is that on top of the Millennial Column in Heroes’ Square, Budapest? It’s a statue of Archangel Gabriel, soaring 118 feet (36 meters) above you. This impressive column is part of the Square’s centerpiece, the Millennium Monument. 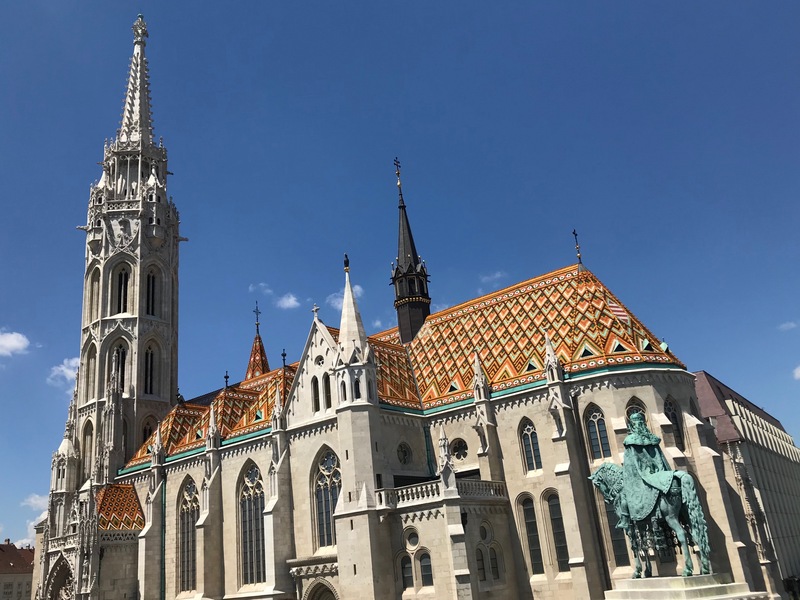 Built in 1896, it marks the 1,000th anniversary of the Magyar conquest – and the leaders, chieftains and important figures who created modern Hungary. Our most significant stop of the day was Matthias Church. This church stood high in the hills of Buda. We walked up an extensive set of stairs from where the bus dropped us off until we reached the square where the church stood. We broke off into tour groups and entered the church. As we walked in, there were two men standing at the doors handing out paper towels for the women to place over their shoulders as we entered the church. I’m not 100% sure why men are so afraid of women’s shoulders being exposed but it was fun for us all to pretend we were paper towel superheroes as we walked through the church allowing our makeshift capes to flow in the breeze. After a quick stop for lunch – which included some incredibly fresh gelato – we made our way back to the hotel to prepare for our last concert of the tour! Tonight’s concert was not an evening concert which was interesting simply because we had to be ready to go much earlier in the afternoon than we were used to. Our final concert was phenomenal. The MOM Cultural Center had beautiful acoustics which allowed me as a singer to be able to hear every section as well as my own and still know that the audience was also hearing the same thing. This was not always the case at the rest of our venues. Most times it was very difficult for the choir to hear across the sections or even their own. The venue did not have any restrictions on the music we could or could not play, or how long the concert lasted. Therefore, we played our entire set list. The crowd absolutely loved us. There were people sitting on the window sills simply because there were no seats left. Something interesting we learned tonight about Hungarian culture is that they don’t clap like we do. They begin clapping but then the audience comes together and claps in a steady beat instead of each audience member holding their own beat. It was a very different experience that truly set Budapest’s concert apart from our other concerts. After group shots on the front steps, we made our way back to the buses and headed to dinner. Tonight’s dinner was unlike any other we had been to so far. It was a complete hole-in-the-wall restaurant with outdoor space that wowed us all and a show which had us dancing in the table aisles. Many of our tour members were brought up on stage by the dancers and asked to dance with the performers. It was truly a night I will never forget.